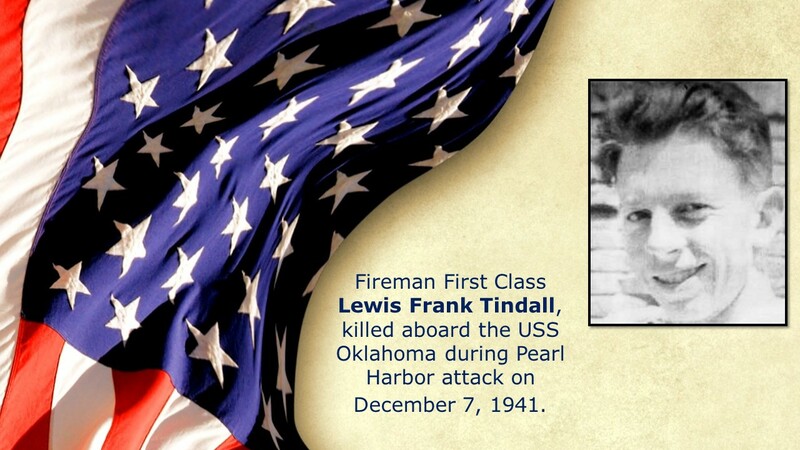 The memory and sacrifice of Navy Reserve Fireman 1st Class Lewis F. Tindall, killed during the attack on the USS Oklahoma in World War II will be honored on Monday March 25, 2019 at 1:00 p.m. the National Memorial Cemetery of the Pacific. According to the Defense POW/MIA Accounting Agency (DPAA), Navy Reserve Fireman 1st Class Lewis F. Tindall, 18, of Oakland, California, killed during World War II, was accounted for on March 26, 2018. On Dec. 7, 1941, Tindall was assigned to the battleship USS Oklahoma, which was moored at Ford Island, Pearl Harbor, when the ship was attacked by Japanese aircraft. The USS Oklahoma sustained multiple torpedo hits, which caused it to quickly capsize. The attack on the ship resulted in the deaths of 429 crewmen, including Tindall. Of the 16 million Americans who served in World War II, more than 400,000 died during the war. Currently there are 72,866 (approximately 26,000 are assessed as possibly-recoverable) still unaccounted for from World War II. Tindall’s name is recorded on the Walls of the Missing at the Punchbowl, along with the others who are missing from WWII. A rosette will be placed next to his name to indicate he has been accounted for. Tindall’s personnel profile can be viewed here. Tindall’s name is recorded on the Courts of the Missing at the Punchbowl, along with the others who are missing from World War II. A rosette will be placed next to his name to indicate he has been accounted for. The 388 sailors and Marines with the Oklahoma who were listed as unknown at the National Memorial Cemetery of the Pacific are are among thousands of unknowns buried there, including some who also perished during the attack on Pearl Harbor, but since 2015, officials with the the Pentagon’s Defense POW/MIA Accounting Agency have been working on a new policy to recover and identify remains of the unknown, relying on extensive research on family history, along with obtaining medical and dental records, and DNA technology, according to KHON2.